There was only so much space left in the truck leaving Fort McMurray, Alberta - the fire-ravaged city under a mandatory evacuation order. And already, Michelle Coutu had packed her daughter, grandson and three dogs in the truck. She had to made a heartrending decision about Marshall the pig. 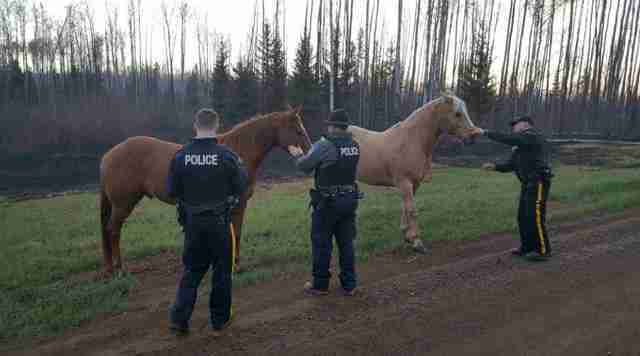 "All I could do is let Marshall out of his pen and put some food down for him and pray for the best," she told CBC News. 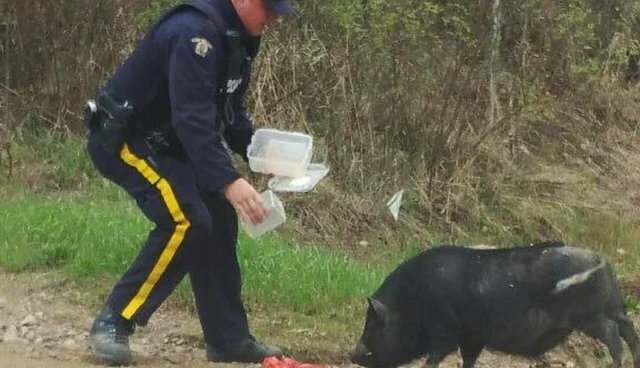 In a decision echoed by hundreds of pet owners across the city in the last two weeks, the family drove off without their beloved pig. But Coutu could do more than pray. She took to social media, pleading with anyone still in the city to look out for Marshall. She also posted on a Fort McMurray pet rescue site. As for Marshall, well, he knew a thing or two about getting out of town in a hurry. When a river near his home flooded three years ago, an evacuation order was issued, and he boarded a truck to safety - but begrudgingly, to say the least. "He's not exactly very cooperative to load up into the truck," Coutu told Metro News. 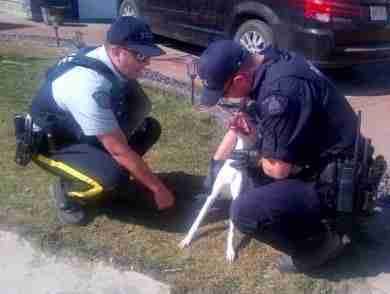 "The last time it took us three RCMP officers, myself, and he's over 100 pounds - not much for car rides." This time there would be no evacuation for Marshall. But it turns out, he does a pretty good job of looking after himself. On Monday, officers from Canada's Royal Canadian Mounted Police (RCMP) were going door to door in the city, looking for those who may have been left behind. They came across some horses. 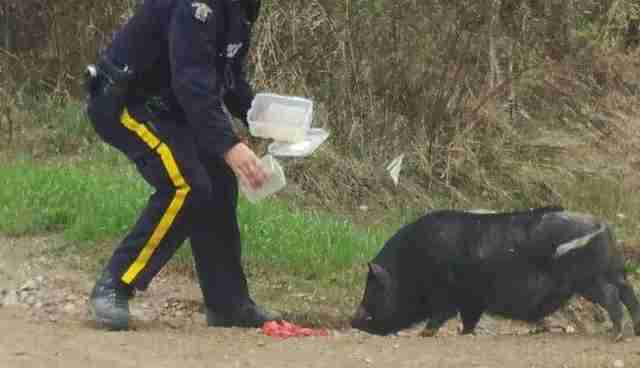 To capture the reluctant pig, officers deployed a tantalizing lure: watermelon. And within minutes, this ultimate survivor was under police protection. His picture was posted on the RCMP's Twitter account. "I was overwhelmed, just ecstatic, when I seen his picture knowing that he was OK," she told CBC News. For now, Marshall is staying at a local animal shelter while he awaits his happy reunion with his family. There's no telling how Marshall spent the time on his own. But Coutu has a theory. "I can just imagine what he was doing to the neighbour's yard and garden, helping himself to any empties of beer cans," Coutu told CTV News. "He likes leftovers in beer cans." Cheers, Marshall. You've earned this one. There are hundreds of pets still unaccounted for in Fort McMurray. Want to help? For a complete list of resources - from how to foster a displaced pet to how you can donate much-needed items like crates to the relief effort - click here. You can also support the Fort McMurray SPCA's efforts to reunite pets with their owners by making a donation here.